Dilovasi, Turkey – Enduring a Siberian winter means suffering through long months of temperatures that regularly plunge into negative numbers. In the town of Tyumen, Russia, for example, the average temperature in January is -16.7 degrees C (1.9 degrees F). Even during the summer, weather remains cool. The average temperature in July is only 18.6 degrees C (65.5 degrees F). 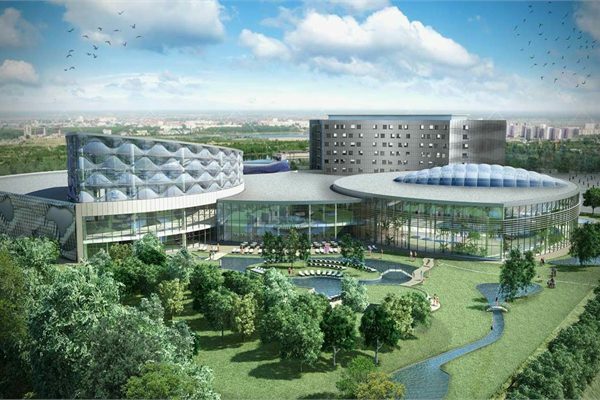 Residents of the Zarechny neighborhood, however, will gain some welcome relief to their frigid climate when a new indoor waterpark – the largest amusement and health complex of its kind – opens next April. Polin will be working with local investment group Sibentel on the facility. Modern AttractionsPlans for the futuristic facility include large translucent domes overhead to let in the sun, while wide expanses of curved glass hold back glacial gales. Palm trees will spread leafy fronds over guests relaxing and swimming within the warm, temperate interior. While those elements might be incentive enough for many to visit the center, the true attraction will likely involve less restful – and more heart-pounding – experiences: a variety of Polin’s most popular waterslides. Turbolance Slide. Tyumen will be the first all-season facility in the country to feature this extreme slide. On it, riders’ adrenaline surges seconds into the ride as their two-person rafts shoot through a series of steep drops and curves. Their momentum reaches a maximum as they are propelled uphill on a wide, sweeping, vertical slope. Rushing to the top, just before they seemingly shoot over the edge, gravity safely pulls them backward in a reverse ride. As their raft turns in circles, they are thrust up and over another giant incline before ending in a splash pool. Windigo. This sophisticated thrill ride begins with guests entering alongside one another in enclosed tubes that then spread out to create geometrical curving patterns high above the ground. Each slide curls around, parallel with the others, with from two to four on each side. Eventually, the tubes realign to create a series of side-by-side, high-speed multiracer lanes. A separate children’s area will be available for the youngest guests, and several large pools will offer more relaxed recreation, including a wave pool. Additional amenities at the facility will be a 170-room hotel and a complex of baths and saunas – about 15 different types, including Finnish, Scandinavian and Turkish options – that will take advantage of local mineral springs. The facility will be able to accommodate 5,000 visitors a day and anticipates as many as a million a year. Its developer hopes the park will attract residents from nearby cities of Chelyabinsk, Omsk andYekaterinburg, as well from the Northern Okurgov. Selim Doguoglu, head of the Russian office of Polin Waterparks, says Polin’s reputation in that country created the need for a local office so that he and his staff could more easily oversee operations there. “Polin is a recognized leader for its innovative and smartly engineered aquatic attractions,” he says. “We’ve already built several of the most successful waterpark facilities in the country, and we expect this one in Tyumen will quickly match those.